2) The Beats website lists confusing information. Ignore it. 3) There are 3 buttons on the Beats2 headphones (they are kind of hidden). On the left side, the "b" is a button. There is also a ring button around the "b". On the right speaker side, there is the small dot-sized power button. The "Outer" button controls volume. The high part of the button ring is up/"increase" volume. The bottom part of the button ring is down/"decrease" volume. Note: Neither of these buttons are needed to pair the headphones, DESPITE what the Beats2 website says! TO PAIR YOUR BEATS2 HEADPHONES, simply hold down the "Main" power button. This is the small dot-sized button which also powers on/off the headphones. Holding this main button for a few seconds will enter the pairing mode. You will know because the LED indicator lights will begin blinking. 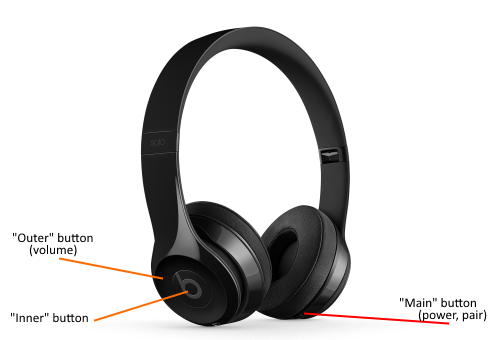 When the lights are blinking, your headphones are in PAIR MODE and can be detected and connected to by your audio device (PC, iPhone, Android device, stereo, etc).